The Daily Evangel: A subliminal reminder to preach the gospel to yourself every day. I guess it had to happen someday. Turns out it did this past summer. Megachurch pastors tend to accept invitations to places where there are TV cameras, and that’s exactly what happened in this case. Tullian’s message of “radical grace” has reached the first family of the Trinity Broadcasting Network. While in many ways, this is an example of worlds colliding, I figure if Peter Lillback can accept an invitation to Glenn Beck’s TV show a few years ago with the intention of making sure the gospel is clearly communicated on his air, then why not Tullian on TBN? The world’s largest Christian television network could do a lot worse, and has built an empire on doing just that. For those unaware, Tullian Tchividjian is the grandson of Billy Graham and the pastor of Coral Ridge Presbyterian Church in Ft. Lauderdale, Florida. He is a favorite among the New Calvinists and is notorious for his popularization of the Lutheranesque “law-gospel distinction” which is taken by many to his right, myself included, as repeating the mistakes of historic antinomianism in some of his rhetoric and in his application of the otherwise valid hermeneutic pioneered by the Protestant Reformer. Among Tullian’s influences are Steve Brown (RTS Orlando and Key Life) and the theologians associated with Modern Reformation magazine and The White Horse Inn radio show. While I believe Tullian when he says he affirms the Reformed teaching on the third use of the law , I also believe his critics when they say his rhetoric smacks too much of historic antinomianism (read about that here). Tullian’s intention is to minister to those burned by legalism, and I’m all for that, even if he may be pushing the envelope of Reformed theology further to the left than I think he should. But I like Tullian in small doses. Few and far between. It has been a while since my last dose of Tullian, so I am prepared to have a good attitude about his appearance on TBN to promote his recent book One Way Love. Besides, it would be inconsistent of me to criticize him for accepting an invitation to speak on Word of Faith turf, since the seeds of Reformed theology were planted in my own mind when Michael Horton appeared on TBN to promote his very first book originally entitled Mission Accomplished (now Putting Amazing Back Into Grace) while still a student at the Bible Institute of Los Angeles (BIOLA). The difference between Horton’s and Tullian’s appearances is that the latter they post on YouTube, while the former they immediately erase, cancel the talk show that featured him, and have the host reassigned to a job behind the scenes. This reaction was due to the fact that Horton was a known critic of the Word of Faith heresy who would go on to edit The Agony of Deceit. My hope is that Tullian’s interview will likewise plant and water the seeds of Reformed theology and the true gospel of Christ among today’s regular TBN viewers. While Tullian admits to being a one-sermon preacher, his message that Christ kept the law perfectly and earned eternal life for those who believe and so frees us to gratefully, though imperfectly, respond to his amazing grace with love toward our neighbors is one we need to be reminded of on a daily basis. 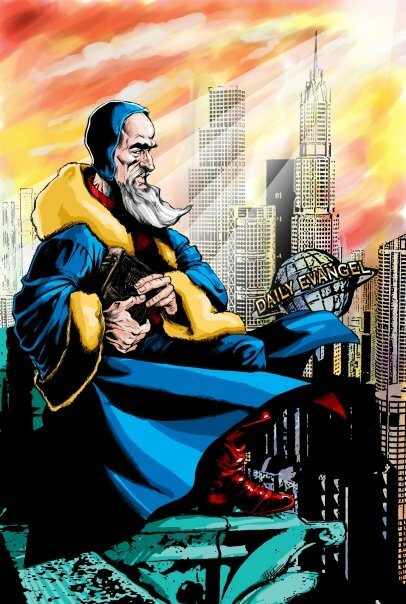 In fact, it is this “preach the gospel to yourself daily” notion that motivated me to put “Daily Evangel” on the building in the background of my picture of Captain Headknowledge. We need the Evangel of the free grace of God in Christ every day, and may it spur us on to love and good works, though we’ll never do them as well as Jesus did them for us. Rachel: Generally speaking, without reading the article yet, I find Tullian to be Reformed lite. Me: true, but it’s a start in a completely anti-Reformed context like TBN. And as I say, I was first introduced to Reformed theology via Horton’s interview on TBN. Based on my experience, I know there are others who will look into tullian’s resources, and seek out more about these other folks he references like Luther, sometimes even Boice and other “Reformed-rich” sources and move on to embrace the rest of Reformed theology motivated by the fact that the unconditionality of our gracious God is at the heart of it. He may be baby food for baby Christians, but sometimes that’s good enough for beginners. I’m hoping and praying for this outcome even if many other less favorable outcomes accompany it–whatever they may be. Rachel: I read your article. I share your concerns with TT. I agree that the viewers of TBN need the gospel. I hope that TT’s message encourages those who are beaten down by legalism. However, I’m not sure that his lopsided message will ultimately help. TBN is fairly strong on the prosperity gospel. I’m afraid that TT’s message of “God just wants to love you” will not challenge that thinking as much as it should. Does that make sense? Me: Yes, I don’t see him literally “reforming” TBN. I may just be projecting my experience re: Horton’s TBN interview onto Tullian’s TBN air time, but I can’t get away from the fact that someone, somewhere can and probably will dig deeper and discover the fullness of Reformed theology. They may be the exception, rather than the rule. The rule may be a bunch of heretics using Tullian’s radical grace to dig deeper into some charismatic form of neo-antinomianism. I don’t know. It may be an emotional response. But for me, that possibility makes all of this less regrettable than it otherwise seems on the surface. I’m anti-TBN, and I don’t spend much time on Tullian either.but I do appreciate his emphasis, and that of others like WHI who so emphasize the objectivity of our justification that it actually moves me to do something about mortifying my sin out of gratitude, rather than as a mere duty, which it absolutely is. I guess I’m rambling now. Thanks for your buckets of water in my face to help me think more clearly. I will certainly chew on your comments. It looks like no reactions can be given on older writings nor on the pages. About the page on creeds may I remind you that Belgica could be found in the Low Countries, of which we still speak in Belgium, but you forget to include Frans Vlaanderen or French Flanders, which is now part of the North of France. So French Flanders should be included as comprising part of the Low Countries along with Belgium and the Netherlands?